Do you want to prevent your skin from turning red, itchy, and painful in these months of summer? Do you want to avoid sunburn blisters, headache, chills, and fever in the hot weather? 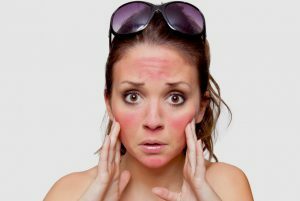 If you nodded along in agreement, then you need to follow some effective tips to avoid sunburn. So, let’s have a look at what causes sunburn and how you can avoid it effectively. Read on to discover all about it. You suffer from sunburn when your body is exposed for a long time to ultraviolet radiations (UV rays) arriving from the sun. These invisible UV rays are harmful and can cause significant damage to your healthy skin. Common symptoms of sunburn are red, painful, itchy skin, blisters on skin, fever, chills, nausea, vomiting, and chills. In order to avoid these hazardous symptoms of sunburn, you need to follow some effective tips. Scroll down to discover some effectual ways to avoid sunburn. Rubbing coconut oil on your skin is a simple yet highly effective way to avoid sunburn. This natural oil possesses excellent healing properties that protect your skin from sunburn significantly. Coconut oil releases strong antioxidants into your skin that strengthens natural defenses of your body and protects you from the damage due to the harmful sun rays. Eating plenty of antioxidant-rich foods regularly is another best way to avoid the hazards of sunburn. The consumption of foods that are rich in antioxidants boosts your immunity significantly against the hazardous rays of the sun. So, ensure that your diet includes blackberries, spinach, cherries, and kale. Also, you can include fruits and foods that are rich in vitamin C and vitamin E in your daily diet. Even though the sun aids your body in the production of vitamin D, the consumption of various foods that are abundant in vitamin D helps safeguard your body from harmful UV radiations of the sun. You can add fermented cod liver oil, eggs, dairy products, and fatty fishes in your daily diet to boost your vitamin D intake and get protection to your body against sunburn. Mineral deficiencies can make you suffer from sun rashes and photosensitivity. Magnesium deficiency and zinc deficiency are some of the common mineral deficiencies that can make you suffer from the hazards of sunburn. So, you need to include mineral-rich foods in your regular diet to get rid of mineral deficiencies. Include both animal and plant sources of minerals in your diet. You can add organ meat, such as liver, green leafy vegetables, bananas, yogurt, dried fruit, shrimp, spinach, kidney beans, and bone broths to your daily diet to achieve a balanced composition of trace minerals in your body. Do not miss adding saturated fats to your diet to have resilient skin. Add robust, saturated fats, such as dietary fats and healthy oils, in your daily diet. They help make your skin tissues healthy and resilient. Thus, saturated fats help in preventing sunburn to a great extent. Increasing the consumption of omega-3 helps boost your immunity and safeguards your skin and body against the damage due to sunburn. Besides your skin, immunity, and overall health, omega-3 also helps protect your brain to a great extent. So, make sure you add fish oils to your regular diet. Omega-3 occurs naturally in foods like salmon and olive oil, so you can add them to your regular diet. Besides the above effective tips, you need to follow some care tips to prevent sunburn. Find them below. Avoid going out in intense sunlight, particularly in the afternoon. Drink ample of water and healthy fluids. Wear loose and light-colored clothing in the hot months of summer. Avoid using soap and cosmetics that irritate your affected skin. If you suffer from painful skin, apply a cold compress to ease it. If you have blisters on the skin, do not irritate or touch them. Did you follow any tips to avoid sunburn in the summer? Which tips did you find highly effective? Share your experience and tips by leaving a comment below. Very useful and effective tips…..